Search for one of the UK’s Most Haunted Hotels. 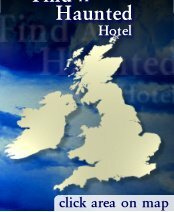 Our unrivalled directory lists over 450 Haunted Hotels, Haunted Castles, Haunted Inns and Haunted Self-Catering Accommodation throughout the UK and Ireland. If you’re looking for Haunted Hotels or Haunted Breaks and want a holiday with a difference, then you can search our site by simply clicking an area on the map on the left or select your search criteria below. If you would like to investigate Haunted Hotels, with the help of some of the UK’s Top Paranormal Investigation teams and Mediums, then take a look at our WeekendHaunts section. Our WeekendHaunts events, which include Bed, Breakfast and 3 Course Meal, give you the opportunity to spend haunted weekends away in some of the most Haunted Hotels, Haunted Castles and Haunted Inns in the Country.